How come? What are these mystical things called marathons? Marathons are 42.195 kilometres (or 26 miles and 385 yards) long. The marathon is named after a messenger in ancient Greece who ran 42 kilometres to a city named Marathon to deliver a message…before he collapsed and died. Running can be addictive – especially if you have a goal time you want to achieve. The body needs a break or you can get injured (to learn how to avoid injury, go here.) Take a rest day once a week or every two weeks at the very minimum. If your knees and back are sore, and you’re minutes behind your desired goal time…train differently. Try high-interval spinning instead. Make sure any injuries heal or they may get worse or turn into a chronic condition. If you know your race is going to be in a high-altitude area, train in a high-altitude area or train with an elevation training mask. Air quality, weather, temperature, and road conditions are all important factors when training. 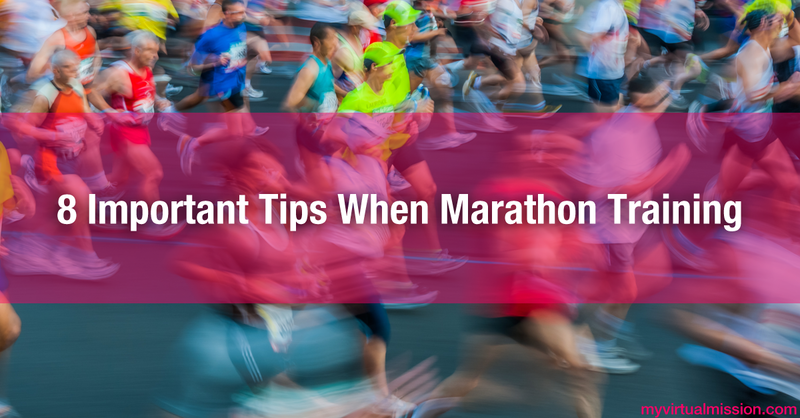 Try a half-marathon or a longer run before your ‘real’ race as a practice run. You may learn some new things about your training being in the race environment that you may not have noticed while training solo. Weigh yourself before you run and an hour after you run. You can figure out how you need to replenish yourself on race day. Hydration is key. Nutrition and hydration are so important on race day and can cause more problems than a lack of training will. Plan what you will eat and drink on race day. Eat within 45 minutes of your race start or you will have no energy in the tank! Do you have any tips for fellow marathon-lovers? Is marathon training a part of your Mission?